you know, sometimes there are some person that can make you smile just by seeing their faces. No, i’m not talking about when you’re falling in love and have butterflies flying inside your stomach, i’m talking about goodlooking people. In my high school back home, there are some boys that i can put into this type, you know the oh-so-goodlooking-type. They were my seniors, named L (who made all the girls in choir stop singing on graduation day when he walked in front of us, seriously) and another is M and R. (PS If you’re in my highschool, and you’re a girl, you’ll know who they are xoxo). Nah, these few days, some of my friends ask me if all french boys are hot like Gaspard Ulliel. Well, no. But suddenly i realized that hey- eventhough not all of those boys are goodlooking, there are actually some boys who are seriously hot. 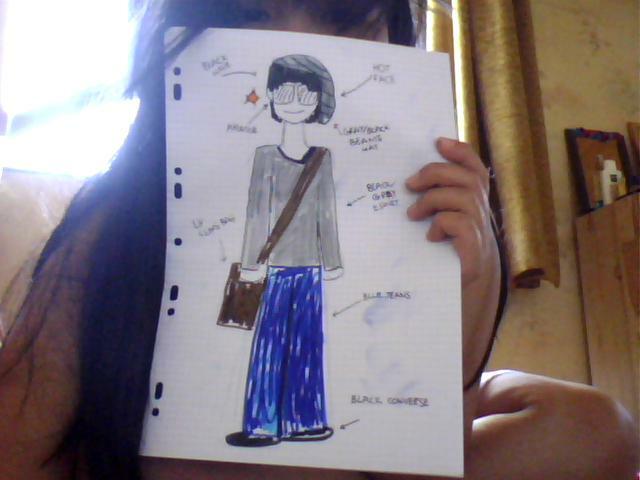 like the one i draw (couldnt get his pic). I dont know what his name is nor his class (absolutely not in my class). He looks like Adam Lambert, just not as ‘extreme’ as Adam. He’s so smoking fuming steaming hot. Okay, at first he had that gay impression, but he’s not gay (my friend told me he has a gf for 3 years, umm i hope they already broke up HAHAHA just kidding, i just hope she was wrong lol :p). He always wears a beanie hat, and he has his own style that never changes each day. Jeans, T-shirt (once he put on a vest), Aviator sunglasses, Jeans, Black Converse, and LV Sling Bag (you know, the postman type)- and oh yeah Louis Vitton. Gosh he’s hoooooooot. I didnt know if French people could be this goodlooking. And i know, he doesnt even know that i’m exist. Or maybe he does, considering that i’m like a stalker, stalking him around haha. I know, i dont have any chance to be his date (or maybe there is? crossing fingers! haha) I guess i’m not falling in love to, it’s just admiration because how many times i have to tell you that he’s the hottest boy on earth? I was standing 1m away from this guy yesterday on the canteen queue, and was eyeing him from 11 am until 1pm *i’m sick! * And hope he didnt realize that there’s a strange wicked girl stalking him around haha. And before going home, i WILL jump infront of him, ask his name and tell mine, and walk away. I wish. haha maybe i’ll just ask someone what his name is so that i wont be curious for the rest of my life. I know this post is rubbish, i was supposed to write something about my fear of going home, but i ended up talking about hot guys.Oh no, i was supposed to study for my DELF test TOMORROW. merde. okay j’arrete. wish me luck for tomorrow, hope the jury will understand what i say and i wont be having problems with those feminin-masculin thingy and those grammars. amen.